Barbizon Midwest Review: Riding Down the Runway! Holly Ridings of Roscoe, IL graduated from Barbizon Midwest at age 15 and was awarded Ms. Barbizon International 2000. Holly has modeled both nationally and internationally in runway shows as well as print campaigns. She was a Ralph Lauren model, Express stores model and in the Kohl's catalog. She appeared on the cover of Foam magazine with a 3-page spread on surfing. 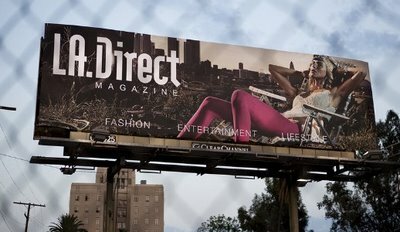 Below is a picture of her on a billboard in L.A., promoting L.A. Direct Magazine ,Holly has also toured Paris, Milan and London on the runway show circuit. She has auditioned for many magazines including Vogue, Glamour, Cosmo, Seventeen, Harper's Bazaar and Elle. Holly was also in the March 2009 issue of Chicago Magazine for their cover article on 'Who Makes What'.